The strange adventures of Allan Gray, a young man whose studies of the Occult have distorted his perception of the real and the unreal. Kinematik is a Lebanese instrumental rock band, whose music blends elements of 70’s psychedelia, progressive rock and post-rock. Kinematik composes instrumental pieces that feature dynamic contrast, strong melodic lines, a heavy use of distortion and effects, and reliance on electronics and synthesizers. Their first album Ala’ will be released by Lebanese indie label Ruptured on LP/CD in 2017. 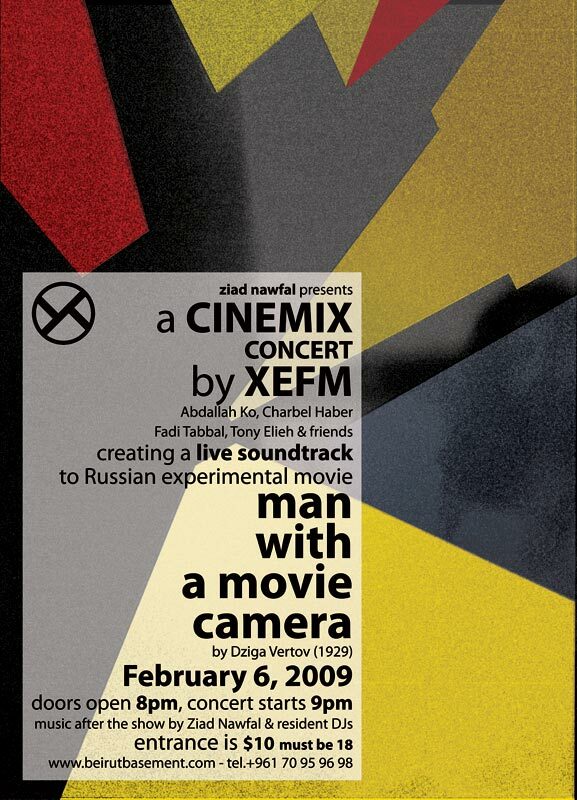 On February 6, 2009, Lebanese experimental rock band XEFM will take to the stage at The Basement, in Beirut, and create a new soundtrack to famed Russian art-house film Man with a Movie Camera. XEFM are no strangers to the Cinemix tradition, as they have already contributed a short piece of music to a Lebanese silent film shown recently at the ‘Né à Beirut’ festival. On this occasion, however, they will tackle an altogether grander task; that of providing a live musical accompaniment to a full-length, celebrated feature. Dziga Vertov’s Man with a Movie Camera was created in 1929. This controversial film is an extraordinary piece of film-making, a montage of urban Russian life, showing the people of the city at work and at play, and the machines that keep the city (Odessa and others) going. Shooting shops, traffic, children, coal miners, workers, human bodies, and nature, Vertov creates visual rhymes and graphic portraits of the structure of life and the explosion of perception. It was Vertov’s first full-length film, and he used all the cinematic techniques at his disposal – dissolves, double exposure, fast and slow motion, freeze-frames, jump cuts, split screens, extreme close-ups, tracking shots, footage played backwards, and animations – to produce a work that is exhilarating and intellectually brilliant, a sublimely fluid vision of man, machine, and society. The XEFM quartet of Charbel Haber (electric guitar), Tony Elieh (bass), Fadi Tabbal (electric guitar), and Abdallah Ko (guitar and electronics), created on their 1st release from 2008, a superb tapestry of sounds, hovering between ambient electronica and outlandish noise. It should be fascinating to hear them transpose their sound, one that is suffused with Beirut’s urban maze, into 1930’s Russian art-house cinema.